CrockerCon 2018 came and went, leaving in its wake the powerful sense-memory of joy and triumph, as it always does. 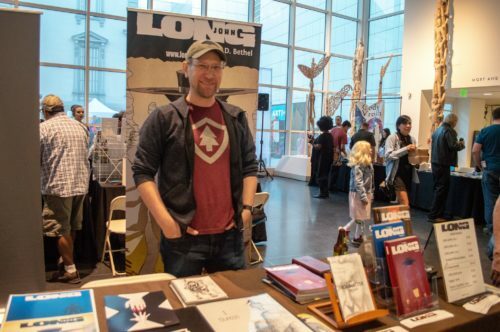 While this will surely be no surprise to people who regularly attend conventions, one of the more humbling aspects of the show is reconnecting people whom I had the pleasure to meet at previous CrockerCons. That it is now possible to see someone I kinda recognize, to realize I met them at an earlier CrockerCon, only to further realize that I initially met them at a CrockerCon four years ago, is a wild feeling. Being a “regular” at a show creates a staccato situational context that exists in furiously hurried moments before pausing for an entire year. That being said, I gush over CrockerCon because I genuinely enjoy every single person that crosses my table, be it for a sale or a conversation, because of its wholly unique context and atmosphere. 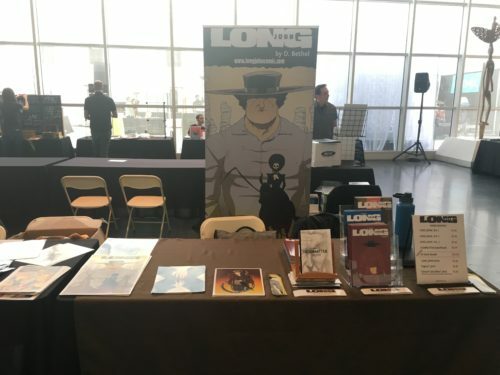 Long John’s table at the event. I also love the show because of its pure celebration of local talent––it’s less about the capitalism of the event and more about putting a magnifying glass over this gathered creativity and shouting, “Look at what Sacramento can do!” I love getting the opportunity to catch up with Kyrun Silva, Eben Burgoon, Melissa Pagluica, Jared Konopitski, Sean Sutter, among many others. Jessica Fearnow went around taking pictures of a lot of the local talent at the show. I used a picture she took of me from a previous CrockerCon as my bio picture for years. It was interesting to go back to a full-table setup. It had been awhile since I put prints out for sale as well as original artwork for people to peruse and compare to the printed versions, the latter of which people took a high interest in, more than ever before, which was nice to see. Some even asked about making a few of the splash pages into prints, which I hadn’t considered before because I so closely tie the page to its narrative that looking at it on its own never crossed my mind. However, it is something to consider. Of the work and books I picked up at the show, there were a few I really wanted to share. First is the work of Sarah René Kraft, a local illustrator steeped in mythology and Symbolist aesthetics, which I completely support. She has been working for years on a series of drawings built around the leitmotif of ribbons, culminating in works of heartbreaking expression and delicate imagery. Dubbed the “Lemniscus” series, the intricate and precise drawings emphasize repeated and important characteristics: the human form, the structural duality of fabric, and the sense experience of touch in all of its forms (comfort, pain, as well as its absence). They are intriguing works that pulse with shrouded biography, careful thought, and pedagogical mythology. 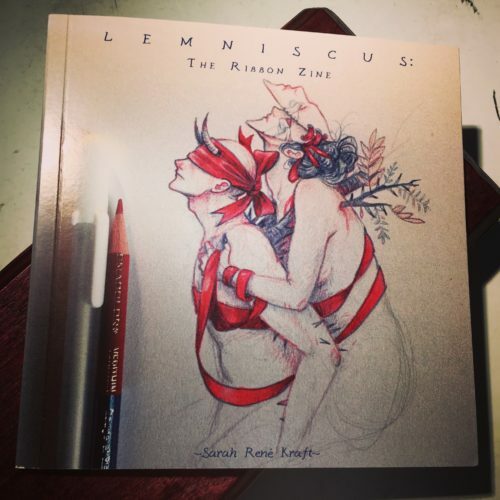 Sarah René Kraft’s “Lemniscus” book. The drawings for this series are done entirely in red & blue colored pencils. What’s impossible to miss is the use of ribbons in the work (lemniscus is Latin for ribbon) where, for me, she deftly uses what we know is a fragile fabric to show both strength––when wrapped taut around figures, holding back against a figure’s strain––and calm delicacy––when hanging between figures or dangling small objects at their ends, for example. She produced a small run of books collecting less the images themselves and more a collection of process pictures, which I enjoy just as much. As a guy that loves process, I can wait for whenever she completes a large book of her drawings, connecting the imagery and the narrative she has been weaving together over time (such things take time), but I jumped on the chance to pick my way through this little book’s artful focus on drawings being made rather than focusing on final products. Another friend I had the chance to get a book from was John Cottrell. A comic artist whose work has feet firmly planted in genre comics (having done everything from comedy-action to horror), John recently started using the medium to do some self-assessment, artistic investigations into how things like anxiety, depression, and loneliness manifest in a creative mind. These journal comics––which he has called Overshare (a genius title) have not only opened up his style and talents but they are really doing bold things with the medium, and though he’s just starting down the road of this type of storytelling, I think he’s found something really unique and, more importantly, completely him. 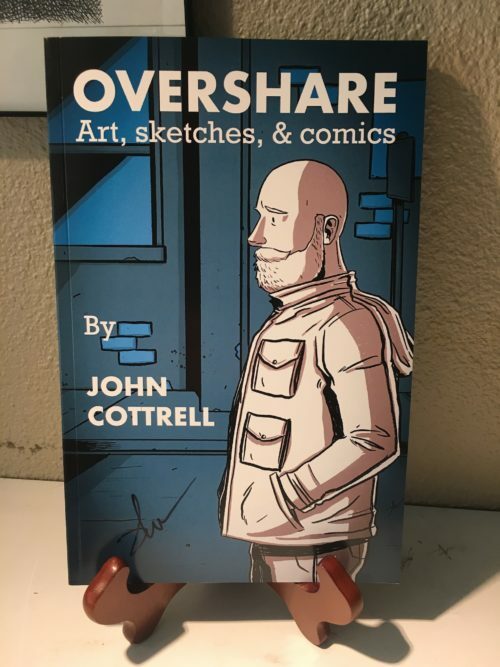 John Cottrell’s Overshare, collecting some of his journal comics, as well as other art and illustrations. Not that they’re alone, but I am enjoying these two artists and what they are trying to say with their work, one through illustrations and the other through comics. Knowing both of these artists for awhile now, I’m impressed with their complete embrace of their skills to speak their minds in raw, sometimes uncomfortable, but important and revealing ways. It’s this kind of work that validates––and embodies––the purpose and goals of CrockerCon itself. In that alone, and in works like these, the show is a tremendous success. Jonny is a Paiute––his actual name is Floating Feather––who is part of the trio known as "The Johns" with Long John Walker and Juan John Velazquez; they came up with his name in order to nail the theme. In his teens, he worked as a tracker and scout for the US Army as they scouted westward, abandoning the work upon meeting Long John and Juan. Of the group, he’s the tracker, the legs. 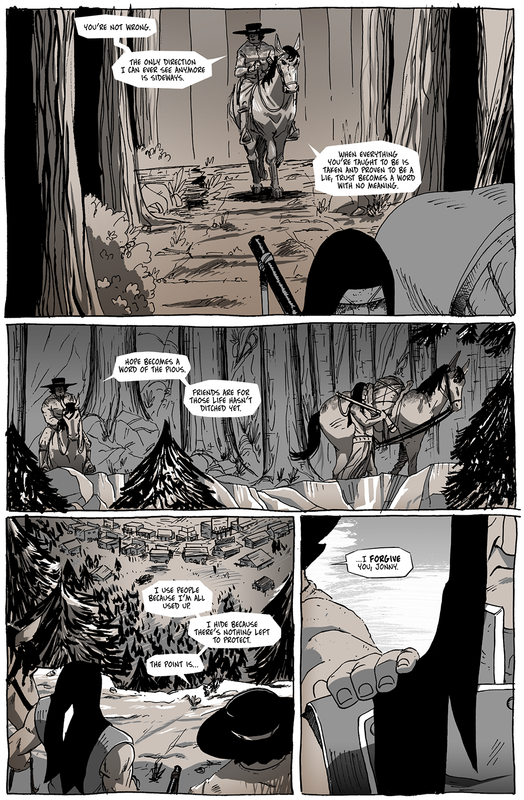 He knows how to survive in the wild alone and keeps the group uprooted enough to be able to get the amount of jobs––and bounties––that they do. It was his connections in the Mono Valley that brought The Johns to the Eastern Sierra Nevada, having grown up as an ostensible little brother to their local contact, Lady May.